As I mentioned in one of my previous posts, Lichi Translations sponsored a large hi-tech conference in Jerusalem, providing simultaneous translation services. At our booth we signed up people for a raffle, offering a prize of a free translation of their website into any language they choose. Pleased to see that so many companies had signed up for the raffle,, we decided that, apart from the main prize, all participants would win a 10% reduction on Lichi translation services, valid until 30.10.2010. Among the companies taking part in the raffle: Alvarion, Deloitte, Kesselman & Kesselman, ECI, IAESI and 40 other Israeli and foreign companies. 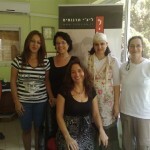 The draw was held at Lichi’s offices in Talmei Menashe on 7.7.2010, in the presence of Israel Topper, our business consultant. The lucky winner was Eyal Rabinovich, co-founder and VP creative and content of Mo’Minis. We were delighted that it was an Israeli startup that won the raffle, and we consider it a privilege to offer our high quality translation services to assist the company in breaking into the international market.